The Quran is understood to be the infallible, divinely protected, decisive word of God. It establishes the personal beliefs of Muslim individuals and sets the principles on how their society is to be administered. It formed the original Islamic State, a theocracy in which God ruled by speaking through Muhammad. Yet while the Quran speaks on many subjects and gives much guidance, it is not comprehensive. 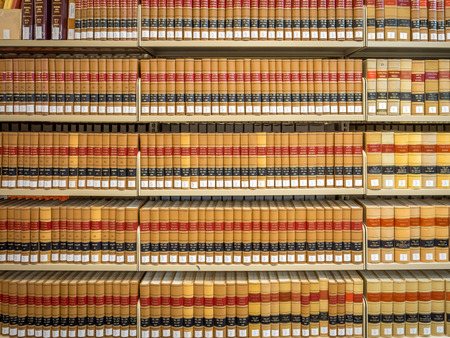 Pictured: just some of the books needed to run United States Government. When Muhammad was alive, the Muslims could take any confusion over interpretation or application to him and receive God’s answer. In fact, the Quran directly refers Muslims toward the prophet Muhammad for such guidance. Once Muhammad died, the religion went on, but it’s practitioners had to adapt substitutes for their living prophet. After Muhammad, the Islamic State was led by four sequential khulafa (plural of khalifa, or “caliph, successor”). During this time, the government remained a centralized theocracy with an all-volunteer military. The first successor was chosen by a council: Abu Bakr, who was one of the earliest converts, Muhammad’s very personal friend and eventual father-in-law. Abu Bakr was already very old, and within two years of his administration he fell sick. He realized that he was going to die and so proposed a man named Umar to be his successor. Umar–who was also an early convert, a respected jurist, and keen fighter–had been helping Abu Bakr plan conquests into the hostile empires to the north. The quorum of tribal leaders agreed to the succession. Umar indeed ran many military successes and served well as a leader, but was assassinated by a slave from the conquered lands. Before his death, Umar selected six men and told the tribal leaders to choose his successor from among them. They selected Uthman, companion and twice son-in-law of Muhammad. When Uthman was assassinated, they then chose Ali, who was cousin, ward, and son-in-law of Muhammad. Unfortunately for Ali, Uthman had indulged in some nepotism and appointed family into prestigious positions (to his defense, his family was of a well-educated class already skilled in administration and were probably critical to holding the newly conquered territories together). A civil war had broken out after Uthman’s assassination, and Ali spent his entire reign dealing with it and the challenges from Uthman’s family. When Ali was assassinated, Uthman’s family took over and established themselves as a dynasty: the Ummayad Caliphate. As this caliphate ruled, the Islamic State was transformed into a secular government with many regional states and professional militaries (often mercenaries from other regions). Later the Ummayad Dynasty would be replaced by the Abbasids. While the first four caliphs after Muhammad are generally credited with devout motivations (they were close friends of Muhammad’s who could be trusted to know what Muhammad would have done or said), the Ummayads and Abbasids were very political and guided by specialty interests, power plays, and luxury. They could not be construed in any way as infallible authorities to decide religious matters. With no leader to trust but a religion still to practice, many Muslims sought to answer their questions and problems by asking, “What would Muhammad do?” The two resources used to determine the answers are the sunnah (“practices, habits”) and the hadith (“contemporary sayings”). The sunnah are like biographical information concerning the life, sayings, and methodology of Muhammad as recorded by his companions. The hadith are less direct information about Muhammad, sometimes even just being recorded opinions of the community contemporary to Muhammad. At least, that’s the best distinction I can make out for myself. The shortest description of these sources: tradition. Sunnah and hadith are usually accepted because they have always been accepted. They ones we have today were written down a few generations after Muhammad and his friends. We have little external information to validate their truths, but also no reason to believe them false except for some internal contradictions and nitpicks. In some respects, they are validated through the same criteria as Christian scriptures or Catholic traditions. The resulting library is quite extensive. No authoritative clergy are devoted to studying, validating, and administering these traditions. It does take a lot of studying in order to conserve and interpret all the resources and history, so academics do tend to achieve a certain exclusivity. Still, any Muslim who seeks guidance and devotion is capable of studying to develop expertise. A community might elevate such a person to leadership and teaching positions in their mosque, calling him an imam (“leader”). Imams are rarely full-time scholars, and indeed their expertise may only extend to mere ritual competence, depending on the community. Very few communities believe in giving such leadership roles to women, so imams are almost exclusively male. Sunni Muslims are those who prioritize the sunnah and supportive hadith in order to approximate the living guidance of Muhammad. They rely on consensus to determine pure Muslim culture, and the kind of consensus they require can often only be found in the past. They are not the default form of Islam, but they do make up the largest population. They also embrace the first four caliphs as being rashidun (“rightly-guided”) and developed their model of interpretation from the patterns established by those four caliphs. All other political leaders are submitted to as secular keepers of the peace, but are not trusted as authoritative in religious matters. Before the traditions of the Sunnis developed, another group of Muslims found their substitute for Muhammad by turning to his family for guidance. Whatever spark of wisdom God had instilled in Muhammad, they determined that it would be passed down in his family through the line of his son-in-law Ali. After all, Ali was the first male convert to Islam, had been raised by Muhammad since the age of five or six, and was married to Fatimah, the daughter of Muhammad by Khadija. The divine wisdom was believed to have been given to Ali, and then passed through to his (and Muhammad’s) descendants. Ali was officially the fourth caliph, but his followers believe that he should have been caliph all along. That Ali and his descendants were frequently persecuted was taken as evidence that they held the Truth and that others were jealous of them. Including Ali, there were twelve of these descendants of Muhammad who were credited with containing a divine spark of wisdom, making them a special kind of Imam. They were not prophets, but functioned more like –for lack of a better equivalent– popes as divinely guided interpreters of previous revelation. The twelfth Imam disappeared mysteriously at the age of five, breaking the lineage and inheritance of this divine guidance. His followers believe that he disappeared, but is alive and suspended outside time and space, and will return to establish a proper Islamic theocracy in the future. In the meantime, they consult their own databases of tradition, which include their own preferred sunnah and hadith collections, to figure out how to live. These “twelver” Muslims are known as the Shia. Another faction exists, although not in mainstream awareness. When Ali was struggling to assert his authority, he entered into negotiation with the family of Uthman to determine the path of succession. Certain followers, appalled that Ali would enter into an agreement with corrupt men, broke away and asserted that no leader could be followed unless he was as righteous as Muhammad. Any leader less than that could only mislead followers, and so such leaders must be overthrown by force. As such, Abu Bakr and Umar were considered rightly-guided and models worth following, while Uthman and Ali were considered failures. The emphasis on sinless behaviour extended beyond leaders until most Muslims were invalidated as hypocrites. The holders of these views are known as the Khawarij. Because leaders are under such scrutiny and the people are encouraged to such volatile attitudes, movements based on Khawarij teachings were usually short lived. Still, the ideas reappeared at various times and places when Muslims grew disaffected with their authorities. The only stable group currently existing are centralized in Oman, known as the Ibadis, and their stability perhaps comes from their more moderate take on traditional Khawarij stances. They are not as inclined to invalidate all other Muslim traditions and also hold that there doesn’t need to be a continuous line of leadership. Khawarij also use the sunnah and traditional materials to approximate the Prophet Muhammad, but they have their own habits of interpretation that differentiate them from the Shia and Sunni. And scholarship, lots and lots of scholarship. Today’s history and material have come from my fledging research into Islamic history. My information comes from the linked Wikipedia articles, Caspian Reports 1 2 3 4 5, and A History of the Arab Peoples by Albert Hourani. (That last source I am still reading, and as of posting I have only finished the first five chapters.) My dependency on these resources has largely been because they provide the least polemic articulation of Muslim history and beliefs. This is an area of history I am very interested in and have practically no prior context to start from. If you know of a good resource, please describe it in a comment below!